Chris Colabello - he had a card in 2013 Topps Update Series; had a good start in 2014 but then turned into a pumpkin; I got him to sign a couple of cards someone provided and I kept one. Danny Farquhar - the guy who has had the most success and has stuck around the big leagues all year long, Topps made a card of him this year and I was able to get two or three signed when the Seattle Mariners played the Angels. Ed Lucas - Topps made a card of him this year and I was able to get the lone one I had signed when the Miami Marlins played the Angels. At the end of last these season, I wanted cards of these players - even though as is, they might not really stick in the major leagues. The last guy I wanted a card for was minor league veteran Doug Bernier - he was up with the Minnesota Twins in 2013 and I got him to sign a ticket stub when he got his first MLB hit. However, Bernier didn't stick around long enough to have a card out - he has spent the 2014 season in the AAA and even if Topps made a card of him, I don't know if I'd see him or not. I cringe as I imagine the lack of starting pitching options available to the Angels after losing Richards Wednesday night - while I'm hoping the beat goes on, it's going to be a wild ride watching the 2014 Angels try to win the American League West and/or get into the playoffs through the wild card without their ace. Richards doesn't look to be back this year, so I just hope he can bounce back and be an effective pitcher at some point - maybe it's just me, but with the fragility of pitchers' careers, sometimes the guys on the mound just don't make it back. By picking this up instead of two of those 100 card hanger repacks - I got 50 more loose cards along with two random [junk] packs as well as a plastic box I can reuse. The cube wasn't sealed by a clear plastic sticker / tape - like previous cubes, just shrink wrapped. 1988 Topps UK Joe Carter #12 - maybe a repack staple, cards aren't bad looking, but they are odd. I picked up another pack of this to supplement another repack purchase at a Target - another repack bust will be posted, but I was also looking to mix something 'new' to what presumably will be an act of leafing through an assortment of older, discarded cardboard. #43 Jon Lester - Gold parallel? I don't think I've bought any new cards recently, but this odd sized card is sort of a new addition to be put away - a stadium giveaway by the Angels as part of the pregame tribute to one of the franchise's stars. For 'pure card collectors' who still care about collecting base cards, building sets or just flipping through cards - opinions on this year's Topps Finest set will probably be polarizing since the base cards look like they were inspired by 1995 Fleer. 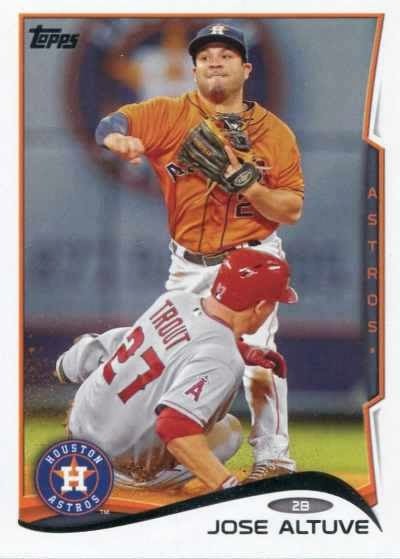 As is, I think the cards look pretty garish and funky looking - however when these is only one manufacturer of MLB licensed cards, designs tend to be conservative and consistent. Even if the finished product doesn't look like it's something that is going to stand the test of time - perhaps a radical change is appreciated, rather than just going with a design that card collectors have sort of been conditioned to like otherwise. So instead of perhaps dismissing the set as just another release, maybe the design makes collectors do a double take - perhaps younger collectors who seem to be enamored by anything new and shiny. As a mini-collection idea, I thought about gathering cards of MLB players who came off the bench as back ups, defensive replacements, or pinch hitters - maybe I wanted recognize certain MLB players' roles as 'working actors' who provided bench strength as opposed to the better known starting players. As is, maybe I just make mental notes of certain guys that fit this category, whenever I bust a pack of cards or go through loose cards - one of those players is the younger Butera, who has followed in the footsteps of his father Sal as a big league backup catcher. The elder Butera played in 359 games in parts of nine seasons in the major leagues in the 1980's - he had two stints with the Minnesota Twins and was part of the 1987 Twins World Series champion team. The younger Butera was drafted by the New York Mets, but started his MLB career with the Twins like his father - before getting traded to the Los Angeles Dodgers in 2013. It was probably my friend who gave me this random Jack Howell card as an extra to get signed at a minor league game at least several years ago - current Angels third base coach Gary DiSarcina makes a cameo and only recently was I finally able to get DiSarcina to sign this particular card. "That's not me," he said before he realized he was on the card. "Oh there I am." For the most part, I prefer one autograph on one card of a player [regardless of any random cameos] unless it's a dual player card [where both players are listed on the card] - however, when I can pull it off, I like the novelty of having two players sign a card both make an appearance on. I like anticipating the reaction of the player making a cameo, wondering if he would taking a harder look, seeing it's not really his card I'm having him autograph - I also wonder how the cameo player will be able to fit his autograph on the same card that has already been signed. Wouldn't it just be something if I can get Jose Altuve's 2014 Topps card signed by him and the guy sliding into him - I don't think that is going to happen with the player making a cameo, though I'm tempted to try. I got $1 off from my Topps / Target coupon book, so that sort of knocks off the sales tax from my purchase - I'm looking for 'new' prospect cards and this break was kind of redundant since all of the prospects I pulled have appeared in various Topps / Bowman products over the last several years. #BPCP 32 Justin Nicolino - refractor? #69 Prince Fielder - maybe a Gold parallel, hard to say though it looks just a little different than a base card. I ran into a long time collector who was selling some extra autograph cards and in his portfolio book, I spotted a Kevin Brown signed card - I saw the autograph was on a 2004 Topps Cracker Jack, so I relented to pick it up for $5. I've been trying to get cards from the 2004 Topps Cracker Jack set signed in-person / through the mail for the past 10 years - as is, there are holes in the set I'll probably will never fill, but it's nice to add another random card to what I have signed already. The Brown is signed in black but I'll take what I can get since in his day, Brown was surly in-person and not someone who would sign in-person most of the time - I know I got a signed card TTM either in 1997 or 1998 and got him once in-person back when he played with the Los Angeles Dodgers.